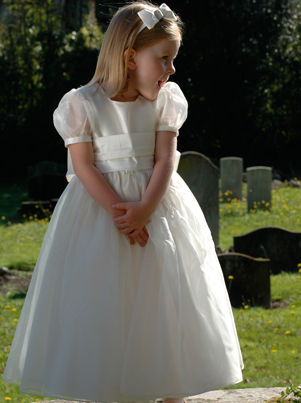 Beautiful silk organza flower girl or bridesmaid dress, with a generous wild silk sash, organza puff sleeves and delicate button details. Generous integral petticoat included. This dress is available in ivory (in stock), white or shell organza – view the full colour range of sashes here.